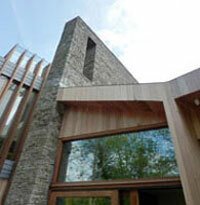 is a stunning modern design from award winning architects Featherstone Young. 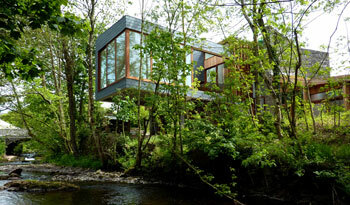 It is perched above the River Ysgir in Wales, five miles from Brecon and the beautiful Brecon Beacons National Park. Ty Hedfan is available for holiday rental and you can get more information and rates in Contacts and Bookings. We designed it as our family home and without compromise, to be a totally unique, utterly modern and luxurious hideaway deep in the Welsh hills. Ty Hedfan can sleep up to 6 people in three double bedrooms and 1 single (3 en-suite). You can enjoy the large living room floating over the river, lounge on one of the two riverside external decks, entertain in the large kitchen and dining area or just relax next to a roaring log fire. When you venture out, the house is surrounded by some of the finest hill country in the UK, with the best walking, mountainbiking, fishing, canoeing or climbing around . You'll find the house is full of maps with walking and biking routes marked, as well as other suggested activities. Sustainable principles were of fundamental importance when we designed the layout of the house which also led to the inclusion of solar panels, green roofs, heat pumps and water recycling. 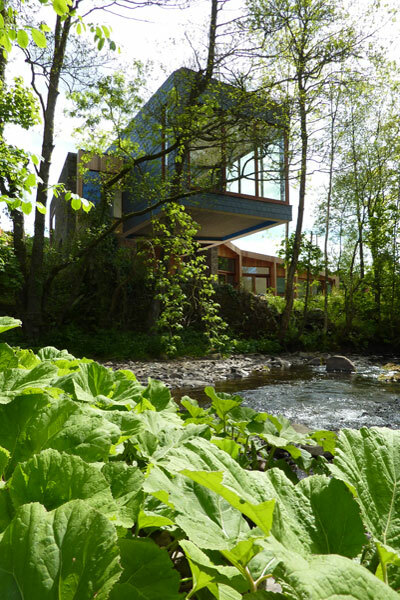 The house won an RIBA 2011 prize.